Team GT is a logo created to support competitive Game Theory players who want to represent the store whenthey play. 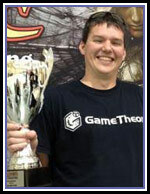 The idea for Team GT was inspired by a group of highly dedicated Game Theory players who were passionate about playing Magic at the professional level and promoting the store. The Team GT logo represents our appreciation of their hard work, competitive success, passion for gaming, and loyalty to our shop. What Games Does Team GT Support? Magic the Gathering is our most active competitive community but the Team GT concept can apply to any game that offers competitive play. As competitive groups emerge within other store communities we are eager to support them. Is There an Actual Team GT? Yes! In the case of Magic the Gathering there is an actual team. 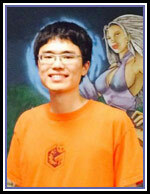 The team is a self-organized group of dedicated Magic players who strive to compete at the highest levels of the game. The store supports their hard work and competitive successes with travel support to Grand Prix, Pro-Tour, and other major events. The Magic team is a self-organized group of players who strive to compete at the professional level. The team is always on the lookout for new members but joining the team is a big commitment and they expect a lot from each other. The typical team member is a loyal Game Theory player who spends several hours practicing each week and travels to competitive tournaments as much as possible. Most team members have been to the Magic Pro-Tour and either have, or are actively seeking, their next Pro-Tour invite. Team members also recognize the value in collaborating, practicing, testing, and traveling together as a team. If this sounds like you, then contact a team member and begin the conversation. I have 30+ Super/IQ top 8s (with 4 wins and many concessions in finals and top 8). I’ve come close to top 8ing multiple Opens, but have yet to clinch a spot in a larger event. A fact I plan on remedying this year. I try to live life with the mantra of pushing mind and body to the furthest extent. Magic is one way I do this for the mental. I also love the social interactions and comradery. My goals as a Magic player have evolved over the years, and as I said I want to place big this year or as soon as possible. When did you first start playing Magic (your first memory)? I first started playing Magic in 2005 (Standard: Kamigawa, 9th Edition, and Ravnica). My first Magic memory was playing with my roommates in college once they FINALLY convinced me to sit down and try it. I have been hooked ever since. Favorite aspect of being on the team? The comradery, hands down. There is also the benefit of being part of a “hive-mind”, giving you access to critiques, perspectives, and insight that you can’t hone take advantage of as an individual. What makes Game Theory different than other game shops? I’ve played at hundreds of game stores and have had numerous “home” stores. None come close to comparing to Game Theory in events, customer service, and efforts in general to promote various gaming communities. My current goal as a magic player is to reach the Gold level in the Pro Player’s Club in 2016-2017. I first started playing magic in 2007 with the release of Lorwyn Block. My favorite thing about being a member of team Game Theory is the testing partners, travel companions and comaradarie. It’s great to have such a great group of players to test and travel to tournaments with. Game Theory is the best place to play in the Triangle. It has the best competition and the best environment for players of all skill levels and abilities. I’m excited to test with other players in the GT community, especially those with goals and aspirations of being on the pro-tour someday. My Primary goal is to make the Pro Tour. I first learned to play Magic in 2001 but didn't start playing competively until Dark Ascension was released in 2012. One of my most vivid memories was watching the Pro Tour for the first time and deciding to build my first competitive Magic decks, Wolf Run Ramp. I love having a group of people I can rely on for good testing and good times while traveling. Game Theory has the most competitive group of players in the Triangle. I am different from some of my other teammates because I don’t have the luxury to play Magic every weekend. I live a balanced life and have a finite time to dedicate towards pursuing magic successfully. Magic is just a game to me, I don’t desire to make it my profession nor do I participate in it solely for profit. So my goals are very deliberate and consist of plotting out the events I want to attend over the course of a year, which typically consists of some GPs that have an appealing location and format, some SCG opens that are within driving distance, the yearly Legacy and Vintage championships, and the nearest SCG invitational. Once I have my calendar plotted out and the planning for expenses and taking time off from work is done, I’ll hone my focus for each event in such a manner that I will have easily positioned myself to succeed and at the very least I will have a positive experience due to my preparedness. I carve out time for testing regularly, starting 1 month before the event. I’m constantly doing the groundwork and bringing up events that are not even on my team’s radar yet because they are more focused on the local weekend tournaments that are held regularly. I book my travel plans early and do my research on the ever-shifting Meta. I consume a lot of content consisting of articles, forum discussions, and gazing over decklists, specific card choices and meta-game share percentages. I’ll pick cards and strategies that I think will be overwhelmingly strong or unexpected for the decks that saw success over the past 2-3 weeks. Then I’ll get to work to create a deck that should produce positive results. So for me, my goals all revolve around preparation and hand selecting the opportunities I want to pursue. I am lucky to live within an area that is a hotbed for competitive magic, there are tournaments every Saturday and Sunday within driving distance. But I won’t just show up at a tournament in my backyard if I am not prepared. My first encounter with Magic happened when I went to visit an out-of-state cousin, he was a year older than me, had numerous random cards and played “casually”, as in I don’t think our decks were close to 40 or 60 cards, consisting of lands and 1-ofs, and we had no sleeves. He introduced me to the game, for that I shall thank and curse him. I don’t recall my age, but I do recall the struggle of my 2/2 Land Leech having to navigate around my cousin’s Leviathan. Stream of life for the win, as my cousin binned islands to feed the Leviathan until he could no longer do so, I took 10 to the face twice, and from that day forward I was known as Ryan “No Blocks” Dail. When I returned home I sought out the game and played from 1997 to 1999. I remember the Tempest and Urza’s blocks which will always hold a special place in my heart. Turn 1 Dark ritual, Dark ritual, Sengir Vampire. Show and Tell my Thorn Elemental, there are no green sources in this deck! Counter Slivers, all my creatures have flying, +1/+1 and can’t be targeted by spells or abilities. Oath of druids with just a spike weaver and a spike feeder, come at me bro! Yawgmoth’s Bargain + Soul Feast, it was a glorious time to experience magic! I can remember saving my school lunch money (a steady $1.25 per day) and using it at the end of the week to buy cards like wasteland and force of will for $2/each. For I was an impressionable teen without an income, in need of a way to spend my Saturdays without getting into trouble. Nostalgia lured me back in 2010 when I came across a Scars of Mirrodin fat pack as I wondered aimlessly in a department store. In one word: Camaraderie. I get to travel and hang out with a group of guys that I trust with mutual respect. That is what makes Magic fun for me. I get to bounce my own ideas and playstyle onto others and gain valuable outside perspective. On trips I’ll make up nicknames for my teammates and suggest prop bets for worst performance, neither get enforced but I still enjoy it. While magic is a game of mental skill, when it is boiled down, you will have a greater chance to succeed by collaborating with others instead of remaining an individual effort. The team aids in my testing process and the collaboration of multiple results and perspectives saves valuable time when preparing for an event. If you want to succeed and accelerate your growth and results, than you need to find others with similar interests and agendas. That is why I took part in building this team. One of the worst feelings you can have as a gamer is walking into a game store and not seeing anyone you know, not being greeted and feeling welcomed, you feel so small and alone, you feel like you don’t belong or can’t relate to anyone in there. I’ve never had that problem with walking into Game Theory. I relocated to Raleigh for better work opportunities and did not know more than a handful of people in the area, luckily I came across Game Theory. Game Theory provided a welcoming environment with a gregarious staff when I was going through some personal misfortune and adversity. I met a lot of close friends and professional contacts by becoming a part of their community. What I can say about Game Theory is that I would not still be playing this game if I had not instilled myself into the welcoming community. There is just no way that this game would have held my attention in any other environment. For me, Magic is an outlet to escape from the stress of life, but Magic can be a cruel mistress with a lot of “I feel bad” moments where you are walking away from a tournament with a bad taste in your mouth. It would be very easy to walk away for good after a tournament doesn’t meet your expectations. Life happens, and I know my own personality, I’m an all or nothing kind of guy, and I would have moved on from the game by now if I did not feel like I belonged with my team at Game Theory. To be consistent. I am very capable of winning a tournament. I don't play with as high technical consistency as I would like. Good finishes would follow. See my teammates improve and do well. It was 20 years ago. My favorite MTG memory was coming back to MTG. I played as a kid for fun. After i graduated college I moved to Raleigh and looked up a card shop. Game Theory was the closest and I didn't even know what Planes Walkers were. I went to FNM to draft and won FNM. 2 months later I was at my first SCG Open and playing PTQs. Everything. Sharing tournament stories, successes and failures. Traveling to big tournaments. Play testing and theory-crafting with the best! GT has a huge play space with a great selection of inventory for cards and board games.what really makes it the best though is the people that come out. So many gaming communities are supported at GT. Never a dull moment! To promote my LGS through professional level conduct in every tournament I attend. Increase my skill level and qualify for the pro tour at least once. I started playing in 1993 with the release of unlimited, I was at NC State and we would hold sealed deck + 2 booster tournaments in the commons area on Friday evenings, pretty sure this type of event happend all over colleges across the country and led the formation of FNM's. The group social aspect, I want to see my teammates do well, and I want to help them achieve thier goals in the game. The store has made customer service the highest priority, it is the only game store in the area with a Team of competitive players who interacts with the gaming community, other stores do not provide that. I want to constantly improve and be able to play a variety of decks. Currently, I struggle to play aggressive decks and all-in combo decks. In addition, I would like to become more proficient at Limited formats. A more concrete goal would be to get onto the Pro Tour. I started playing casually during Kamigawa/Ravnica block and took a huge hiatus almost immediately and started playing competitively during SoM/Innistrad standard. The first thing I recall was trying to build a deck from using winnings from a local Yugioh tournament to buy Champions of Kamigawa packs, only to find the store only had Betrayers packs left. I open an Umezawa's Jitte and trade it off for a casual RW aggro deck. Having friendly players with similar goals of constantly improving at MTG. The player base is much more welcoming than others. I am always invited to play and join in conversations by merely being around. In addition, the GT staff is overall more helpful than the staff at other shops. My main goal as a player is to have fun, but I try to be a positive player on the game and local magic community. I enjoy helping new players if they have questions, especially in limited, but I also try to mentor some of the up and coming players that are open to it. I do not have the time to commit to playing that I once did, but I do want to make it back to the Pro Tour. My dream is to win a limited Grand Prix because it is the highest competition strictly limited event that Wizards still offers. I first started playing with my brother Land when I was around 10-11 years old. We bought some packs of Ice Age at a Roses store in South Hill, VA. One of my earliest magic memories was beating my brother to win his Grinning Totem that he flipped for the ante. I first started playing competitively shortly after receiving my DCI number at the Mercadian Masques pre-release by competing in the now defunct Junior Super Series. Team Game Theory has many members that bring different perspectives and ideas to the tournament preparation process. We have the largest, most accomplished group of competitive players in the Triangle area and being able to lean on them for help is key to continued success for me in Magic. Game Theory is committed to fielding a competitive, store-sponsored team in Magic: the Gathering, which other stores do not see as worthwhile. Game Theory also has an awesome customer appreciation day every year! Don’t miss it! Qualifying for and becoming a mainstay on the pro tour is my goal in magic. I also would like to win a grand prix. I started playing in Onslaught and became competitive around the time Darksteel came out. My first Magic memory is showing up to the Junior Super Series Championships in Kansas City with a mono red Land Destruction deck with Rorix Bladewing as the finisher. I went 7-3 in that event, all 3 losses were to Goblin Bidding. To me, being on the team means support eachother in our goals and helping eachother to get better. Coming together and testing for events as well as supporting eachother at those events is a great feeling. Comaradarie. Game Theory fosters an environment of competitive players and gives us a place to call home while we work to become better. My Goals are simple don’t lose and try to not get variance’d out of games. I like to Judge and play and have recently come off a hiatus of 6 months going forward I plan to re-que for the PT and represent team Game Theory doing so! My first Magic the Gathering Memories are from my best friend getting cards and decks together when we both played Yu-gi-oh competitively and he couldn’t beat me at it so we took to a new game. Having a centralized community to uplift and assist you as a player is a great tool to have at your disposal, I like to know others lines to know a different thought process during my games. My most useful aspect is the ability to analyze others and recommend stronger or at least different lines. We have the best players, best staff, and best patrons out of any of other local game stores.